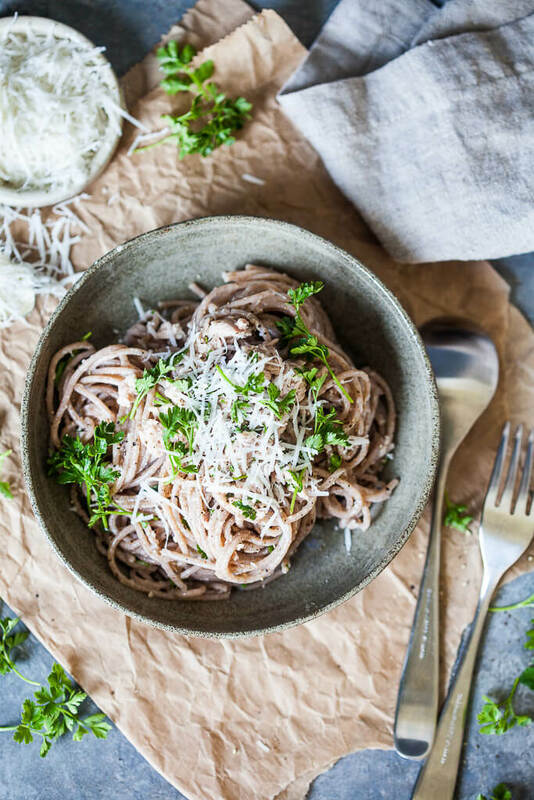 This Whole Grain Spaghetti al Tonno takes literally 10 minutes to make! This is the ideal lunch for busy days and uses just a couple of ingredients. Bring a pot of water to a boil, then add a pinch of salt to water and spaghetti. Reduce heat to medium and cook according to package instructions, until the pasta is al dente (about 8 or 9 minutes). When the pasta is cooked, save a cup of pasta water and drain the pasta. Return pasta to pot, add canned tuna (oil included), season with freshly ground black pepper and chopped parsley and mix well. If the mixture is too dry, add a splash of pasta water and mix together. Serve on plates and top with some grated vegan or Parmesan cheese.